This entry was posted on Tuesday, July 3rd, 2018 at 12:00 pm and is filed under biology, chemistry, information and entropy, networks. You can follow any responses to this entry through the RSS 2.0 feed. You can leave a response, or trackback from your own site. Hi John, Jonathan, Blake and Maru. Thanks for the insightful series of posts. You might be interested in reading some of Robert Alberty’s work. I think in particular his article “Calculation of Equilibrium Compositions of Large Systems of Biochemical Reactions” is relevant to both accounting for ions (which he handles by assuming constant pH, and transforming the ions out), and emergent conservation laws. If you will pardon my blatant advertising, you might also be interested in some of the work going on at our lab regarding bond graph models of biochemical systems. I looked at your web page. Your ‘bond-graph-clinic’ pdfs I found very good –i’ve seen some or many of the formulas in other forms in statistical mechanics, theoretical chemistry and biology. Those would be fine tutorials/classes. I never had time, competency or discipline to master the details though I had heard of previous applications by Oster, Katchalsky and a precursor–G. Kron. (Most people would say I need another kind of clinic–and i agree, except not the kind they think i need.) Since i could never understand ‘electricity and magnetism’ electrical circuits confuse me. I just like simple signed and labeled graphs–maybe its like music–some like rock, or classical, or jazz, or hiphop though they all overlap. My own interest has been trying to reduce all these into ‘one equation’, but I can’t do it. There are papers which do try to do this. I was interested you use GitHub–something i only recently heard about because another group i’m slightly involved with uses that for basically ‘social enterprise startups’ (i.e. help people in areas which have few resources or education) set up their own small permaculture communities—gardens for food, little libraries, a computer cafe (since most people can’t afford to buy one so they buy them collectively and share them at the cafe) , help people get a smartphone, etc. Anyway, just saying your pdf lectures look good. What are the hidden symmetries behind emergent conservation laws? Great question. I think I know the answer, but I’d have to do some calculations to be sure. I’m supposed to give a talk in October at Symmetries, Observables, and the Noether’s Theorems: A 100th Anniversary Conference for the Work of Emmy Noether. Maybe I should figure this out and include it in the talk. Maybe I should publish a paper on it. Exactly question i had—it appears the article deals with chemical or mass conservation laws, not the kind dealt with in group theory (noether’s theorem). To be precise, our article deals with emergent conservation laws, which cannot be explained by conservation of things like phosphorus, iron, charge, mass etc. Biological systems evolve to create these new conservation laws for specific purposes—basically, to prevent certain bad things from happening. The idea is explained in the introduction. You folks are making me eager to generalize Noether’s theorem to cover chemical rate equations, and I think I know how. I think I got your explanation in the Introduction to your paper —these laws are sort of macro properties or metastable states . I think H Haken’s ‘order parameter’ (and his ‘slaving principle’ ) as well as I Prigogine’s ‘dissipative structures’ are similar ideas. A random google finds https://arxiv.org/abs/1712.02375 –another kind of emergent conservation law. There was also an example in your applied CT course which i plan to look at again which referred to ‘efficient markets’ (or open and closed systems) related to this but i forget which lecture and the exact example, tho i can probably find it. (Had a question in it and i wanted to know the answer. Anyway this is all interesting tho i don’t have much time for it. All the species involved are made of 6 different atoms (carbon, hydrogen, oxygen, nitrogen, phosphorus and sulfur), and conservation of charge provides another fundamental conserved quantity, for a total of 7. Good point. For the urea cycle we did a little computer calculation to check that all our conserved quantities, fundamental and emergent, were linearly independent. We didn’t do that here, mainly because this example isn’t going into our paper. If we did, we’d take a certain 12 × 22 matrix and show all 12 rows were linearly independent. We did a similar computation for the urea cycle that appears in our paper. 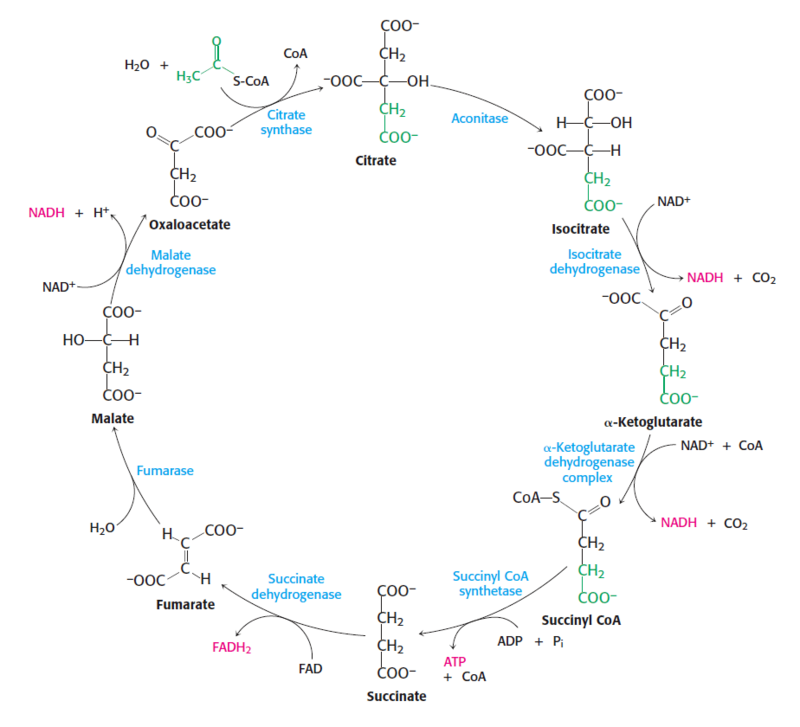 There must exist 12 linearly independent conserved quantities for the citric acid cycle, since there are 22 species and 10 linearly independent reactions. So if our 12 conserved quantities turned out not to be linearly independent, there would be others that were, and we’d have to find them. That too, of course, could be done by computer. But I learned a lot by finding conserved quantities by hand: it turns out you can visually identify a bunch just by looking at the reaction network, and this turns out to be connected to (some very simple bits of) cohomology theory. There are a few problems with this example. I submitted a comment earlier, but I don&apos;t know what happened to it; I never got the email to confirm that I want notifications of further comments. Hopefully I&apos;ll remember everything. To begin with, the 23 species here, not 22. At some point, you say that H+ isn&apos;t included among the species, which would reduce the number to 22, but thay would also mean that you can&apos;t include conservation of hydrogen and charge among the conservation laws. (You could still include the difference of those two laws, however.) So we&apos;re short a conservation law. Also, the law you claim ‘expresses the fact that during the first 7 reactions of the citric acid cycle, one molecule of acetyl-CoA is destroyed and one molecule of CoA-SH is formed’ is wrong; two of the reactions violate it. The fact that it&apos;s claimed to express is true, however; unfortunately, the law that actually expresses this (following the pattern set by the immediately following example) is the same as the law of conservation of sulfur. So now we&apos;re short two laws. The immediately following example might be independent now; I haven&apos;t checked. Nor have I tried to come up with a law by direct calculation. In principle, these calculations done, but they don&apos;t sound fun. I do know one thing, however: the conservation law that we need to add if we include acetate among the species. Unfortunately, it’s a boring law: conservation of acetate. Unfortunately, it’s a boring law: conservation of acetate. Yeah. This is one reason we didn’t include this example in our paper! In the urea cycle example, which we wound up using instead, we decided not to count and as species. But in our work on the citric acid, we painstakingly made sure all reactions conserved charge and hydrogen, which was hard because (as noted elsewhere on this thread), most online references don’t get these details right. It sounds like I didn’t manage to count the species correctly, though. Anyway, thanks for the corrections. It would be nice to do something with this example someday; I’m just not sure what.